A huge resource for members of our professional society INFORMS (Institute for Operations Research and the Management Sciences) is the INFORMS Speakers Program. Through this program, one can request a speaker on the Speakers Program list and it is a fabulous list! Typically, an organization requests a speaker and this is an excellent service for INFORMS Student Chapters or Regional INFORMS Chapters. Indeed, this resource was also emphasized at last spring's wonderful Student Leadership Conference in Austin, Texas at which two of our chapter officers, Pritha Dutta and Deniz Besik of the Isenberg School, took part in. I had chaired this committee a few years ago and very much enjoyed working with Dr. Les Servi of MITRE and Dr. Tim Lowe of the University of Iowa to expand the list of speakers.Speakers are from academia and from industry and are experts in operations research, the management sciences, and analytics. The host organization is responsible for on-site expenses of the speaker but INFORMS (of course, budget allowing) covers the travel costs. I've enjoyed very much being a speaker in the INFORMS Speakers Program at various universities (including Texas A&M and the University of Pittsburgh) and also at INFORMS chapter sites (Dallas and Boston). And when Mary Magrogran, the Director of Membership, Subdivisions & International Activities of INFORMS, reached out to me last week whether I would be willing to speak at the University of Alabama this semester, I checked my schedule and we found a mutually convenient set of dates so I am very much looking forward to going there and seeing operations research and analytics colleagues and students! As the Faculty Advisor to the UMass Amherst INFORMS Student Chapter (since the chapter was founded in 2004), I also help the students in organizing a speaker series and believe fully in the importance of bringing speakers to campus. We have availed ourselves of the INFORMS Speakers Program over the years and the students, faculty, and even staff, who were lucky enough to hear our guests speak treasure those memories. Also the networking opportunities are clear. We have had the following speakers from the INFORMS Speakers Program come to the Isenberg School of Management (note that some may no longer be on the list but others continue providing this valuable, very educational service): Dr. James Benneyan of Northeastern University, Dr. Sheldon Jacobson of the University of Illinois, Dr. Radhika Kulkarni of SAS, Dr. John Birge of the University of Chicago. We have also hosted Dr. Les Servi of MITRE and Dr. Richard Larson of MIT who are on the list (although we did not request funding from INFORMS since they are quite local). We also had the pleasure of hosting Dr. Brenda Dietrich of IBM in our UMass Amherst INFORMS Speaker Series! Below are some photos of the above named guest speakers. Many thanks for their willingness to travel and speak to audiences that benefit greatly from their lectures and discussions that follow. Also, a BIG thanks to INFORMS for sponsoring the INFORMS Speakers Program. Dr. Brenda Dietrich's talk was on Services Sciences: A New Opportunity for Operations Research. And, for those of you who are interested in some suggestions as to how to organize a successful Speaker Series, please see one of my most popular blogposts on this topic. When I was appointed the John F. Smith Memorial Professor of Operations Management at the Isenberg School in 1998, becoming the first female to hold a chaired professorship in the UMass system, I thought of ways that I could give back. With the enthusiastic support of my husband, we decided to establish a scholarship for Operations Management undergraduate students in the Isenberg School. After years of donations, 5 years ago, delightfully, when I was a Visiting Professor at the School of Business, Economics and Law at the University of Gothenburg, Sweden, I heard from one of Isenberg's former development officers, Bonnie Dowd, that there were sufficient funds to give out a scholarship, called The Nagurney Scholarship. The former Dean, Dr. Thomas O'Brien, helped in setting up the original account and figuring out the payments to make this scholarship realizable and for this we are very grateful. I am very pleased that we have now have had 4 Nagurney Scholarship recipients. The scholarship focuses on students who have interests in Transportation and Logistics and a committee (which I cannot be part of since I am the donor) decides who will get the scholarship. Today, I was so happy to have the most recent recipient stop by during my office hours after I taught (and thoroughly enjoyed) my Transportation and Logistics class so we took the photo below. It was great to catch up and she shared with me the fabulous news that she had secured an offer from a leading consulting firm in Boston! Prevous Nagurney Scholarship recipients, all Operations and Information Management majors at the Isenberg School, have gone on to positions at top services and manufacturing firms. The first Nagurney Scholarship recipient was honored, along with other scholarship recipients, at a lovely, special event in the spring of 2014 that I had blogged about. The photo below was taken at that event and joining me are his mother and our great Isenberg School Dean Dr. Mark A. Fuller. In 2015 the scholarship celebration was moved to UMass Amherst. Scholarships help tremendously in supporting deserving students so that they can focus on their academic work. The Thank You notes from the scholarship recipients I treasure. For a full list of scholarships at the Isenberg School click here. As a Professor I am proud that the Nagurney Scholarship, my teaching, publications, and supervision of doctoral students are key parts of my legacy. The undergraduate scholarship also signifies the importance of undergraduate students to my work at the Isenberg School and the University of Massachusetts Amherst. 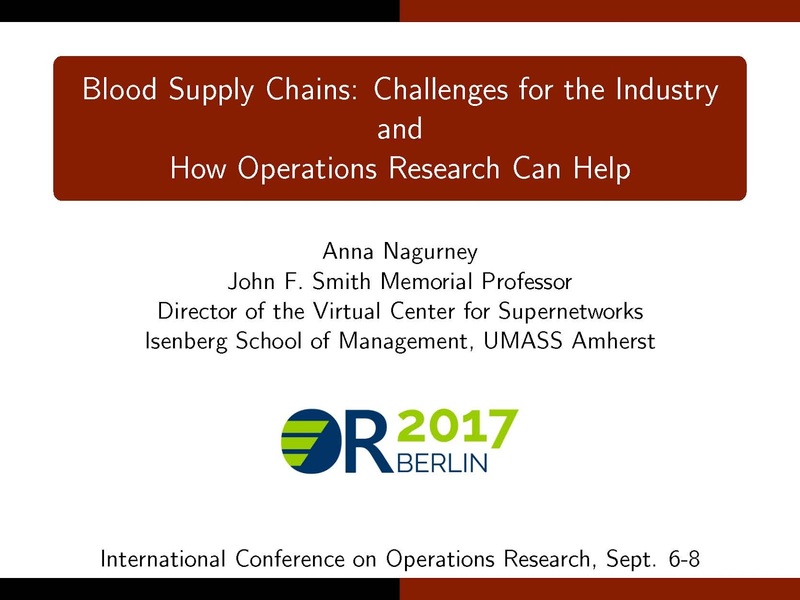 Yesterday evening I arrived back in Massachusetts from the fabulous International Conference on Operations Research, OR2017 Berlin, in Germany. The invitation to delivery a semiplenary talk at this conference I received back in November 2016 from Professor Jan Ehmke, a super creative, dynamic, and productive scholar in transportation and logistics and very well-known in our INFORMS community. Professor Ehmke was one of the two Chairs of the Program Committee, along with Professor Natalia Kliewer of the Freie University, and was also on the Organizing Committee. It took me only about 24 hours to respond with a resounding, "Yes." I figured it was doable, although the dates of the conference September 6-8, 2017, coincided with the first week of classes at UMass Amherst. Professor Ehmke kindly scheduled my semiplenary on the Friday, the last day of the conference, so that I could meet with my Transportation & Logistics class students for the first class and a wonderful doctoral student covered the second class. (I am bringing back a lot of chocolates for the students). Also, I am delighted that we now again have a direct link from our local airport, Bradley in Hartford/Springfield, to Europe, with a daily flight to Dublin via Aer Lingus, which made the trip to Europe and back in 4 days manageable. I gave Dr. Ehmke a list of topics that I could speak on and the one selected was: Blood Supply Chains: Challenges for the Industry and How Operations Research Can Help. So, after teaching my first class this past Tuesday, I was off to the OR2017 Berlin conference via Aer Lingus, with a short layover in Dublin, and I arrived Wednesday morning in Berlin. Accommodations were in the Harnack Haus, a historical scientific building, with additional rooms across the street and in proximity to the conference venue, which was the Freie University, in a green and stunning part of Berlin known as Dahlem. The main building there for the conference was the Henry Ford Building. Shortly after registering at the guest house, and while marching with my luggage to the site of my room, I was greeted on the street by the Chairs of the conference: Professor Natalia Kliewer and Professor Rolf Borndorfer of the Freie University. After freshening up, and, before going to the sessions, since the scientific program with a theme of the conference being: Decision Analytics for the Digital Economy, I treated myself to a marvelous lunch at the neighboring French cafe (several of us also indulged in some baked treats the day after). The conference had numerous coffee breaks, receptions, a conference dinner, and even lunches, at which one could socialize and discuss with speakers their research. Below is a photo taken with Professor Ehmke. It was special to see my colleague from the University of Connecticut School of Business, Professor and now Associate Dean Robert Day, who also took advantage of our new air link to Europe. I thoroughly enjoyed all the talks that I attended and, of course, the plenary and semiplenary talks, as well (although it was tough to decide which ones to go since the latter had multiple parallel ones). The scientific quality of the presentations was uniformly excellent and I very much enjoyed talks from sustainability and logistics themes to social network models to machine learning and optimization. I enjoyed speaking with Christian Rauscher, a Springer editor, and his colleague at the Springer display booth. I have seen Christian at wonderful Operations Research conferences around the globe. Also it was a pleasure to see fellow INFORMS Fellow, Dr. Robert Fourer, who even came to my semiplenary talk. Another wonderful experience was seeing the one and only Professor Marco Lubbecke from Aachen, who also gave a semiplenary talk and meeting Professor Jan Ehmke's dissertation supervisor at a sumptious breakfast: Professor Dirk Mattfeld. Professor Stefan Zimmer was the chair of my semiplenary session and afterwards I was presented with a lovely gift of a personalized mug with the title of my talk on it and some yummy gummy bears inside. After my presentation, I spoke with conferees from India who are also working on blood supply chains. Amazing to have 46 different countries represented at this conference! and I came upon the John F. Kennedy Institute at the Freie University, where I had given an invited talk 15 years ago, when I was a Distinguished Chair at the University of Innsbruck under a Fulbright. Coincidentally, when I received my PhD from Brown University in Applied Mathematics in 1983, with a specialty in Operations Research, John F. Kennedy Jr. received his undergraduate degree and his mother, Jackie Kennedy Onassis, was there (and my mother was thrilled). I have also met his sister Caroline Kennedy at an event at the Radcliffe Institute at Harvard University a while back. This was my third trip to Berlin - in March 2015 I gave a plenary talk at a physics conference entitled: Design of Sustainable Supply Chains for Sustainable Cities. The OR2017 Berlin conference set new standards as to attention to detail and organization and I am very grateful for experiences that I will never forget. Of course, I also had to indulge in some Wiener schnitzel, which will keep me fortified for quite a while, and it was as delicious as it looks in the photo below. And, on my flight back from Dublin to Hartford/Springfield I rewarded myself by watching the movie Hidden Figures, about AfroAmerican female mathematicians who made an impact on the NASA space program. And, when the Euler method was mentioned as the method Katherine Johnson used to approximate a very important trajectory in a eureka type moment, I was thrilled. Our work on projected dynamical systems, which I had mentioned in my semiplenary talk, also involves a general iterative scheme, with a special case being the Euler method! Plus, guess which books have been on my bedside stand?! During OR2017 Berlin, we received messages that the INFORMS conference will take place at the originally scheduled dates in Houston, despite Hurricane Harvey, so I hope to see again many colleagues back in the US. And, strangely enough, the case study that I described in my semiplenary talk, based on our recently published paper, was focused on a blood service organization in Florida potentially merging with another organization under status quo and disaster scenarios, and now we await the brunt force of Hurricane Irma, the strongest hurricane ever recorded in the Atlantic. Operations Research has never been more important! Today is the deadline for submitting your nomination for the INFORMS Judith Liebman Award. According to the INFORMS website: The Judith Liebman Award has been established to recognize outstanding student volunteers who have been "moving spirits" in their universities, their student chapters, and the Institute. The award will be an 11x8 mounted certificate signed by the Vice President for Chapters/Student Chapters/Fora, and a letter of congratulations, in a form suitable for sending to each recipient's department chair. The full list of recipients, to-date, beginning with 2004 until 2016 can be found here. And what a truly impressive list of amazing student volunteers they were (and some still are students). Many have gone on to much prominence at their places of employment and also at INFORMS. Today was also the day that the official notification went out to the recipients of the 2017 INFORMS Service Award, and, since I had the pleasure of serving on that committee, with Dr. Lauren Davis as Chair, I am reflecting on the importance of volunteerism. Clearly, Hurricane Harvey has also put us in a frame of mind of "volunteering" in whatever way feasible. Last year I was among the group very honored to receive the first set of INFORMS Service Awards. The recipients of both the above awards will be honored at our Annual INFORMS conference, which is supposed to be in Houston in October, but we will see if the location is moved. I have met Dr. Judith Liebman, after whom the award is named. She was a contemporary of my PhD advisor, Dr, Stella Dafermos, and both were PhD students in Operations Research at Johns Hopkins University together. A wonderful blogpost on Dr. Liebman, and some of her impact, can be found in a post by her granddaughter Lauren. Speaking of the dynamos who have received the Judith Liebman Award and that I have had the pleasure of interacting with, I mention Thiago Serra of CMU, a 2016 recipient, with whom I had dined not long ago at the UMass Club in Boston. Joining us was also Dr. Michael Prokle, a 2015 recipient of the award, who recently received his PhD from UMass Amherst. Michael is a Data Scientist at Philips Research North America working on health care related projects. who not only is a previous President of INFORMS (I believe the youngest one ever) but she was also a recipient of the Judith Liebman Award the very first year that it was given, back in 2004! Below is a photo of Dr. Robinson being thanked by Dr. Masoumi after her keynote speech. I would be remiss not to acknowledge Dr. Kayse Maass, also a recipient of the Judith Liebman Award, the same year as Michael Prokle, and now a researcher at the Mayo Clinic in Minneapolis. Kayse is doing extraordinary work in healthcare modeling as well as battling human trafficking. I had the pleasure of seeing Kayse at a workshop sponsored by NSF on Disrupting Illicit Supply Networks last May at the University of Texas Austin. Below is a photo taken at the workshop in which also Dr. Georgia-Ann Klutke, the NSF Program Officer, and Dr. Renata Konrad of WPI, who has written with Kayse, appear. In 2006, there were two recipients of the Judith Liebman Award, Dr. Burcu Keskin, an extremely active INFORMS member, and my former doctoral student (I had nominated her) Dr. Tina Wakolbinger, who is now a Full Professor (having achieved this status only 4 years after her PhD from UMass Amherst) at the Vienna University of Economics and Business in beautiful Austria. The photo below of Tina and me was taken in Vienna this past June at a conference on Humanitarian Operations organized by Tina. Tina was instrumental in helping me to start the UMass Amherst INFORMS Student Chapter, and she, along with Burcu, wrote up guidelines, on how to do this for INFORMS. In 2009, Dr. Qiang "Patrick" Qiang received the Judith Liebman Award. I had nominated Patrick, who was my PhD student, and whose dissertation received a national transportation award. He is my co-author of the book: Fragile Networks: Identifying Vulnerabilities and Synergies in an Uncertain World. Patrick is now a tenured Professor at the Graduate School of Professional Studies at Pennsylvania State University Great Valley. And to show the kind of support Patrick and Amir provide to the UMass Amherst INFORMS Student Chapter, which they were all part of and their extraordinary efforts garnered them the Judith Liebman Award, below is a photo from the Nashville INFORMS conference in November 2016 taken at the student chapter award and Judith Liebman Award ceremonies. They come back to support the students and for this I am eternally grateful. Above I have only highlighted those Judith Liebman Award recipients that I know personally. All recipients deserve a big round of applause for their hard work, selflessness, and energy! I might mention that just being nominated is an honor. And, since some have asked, yes, you must be an INFORMS member for two years to be considered eligible for this award, which is only given for work as a student volunteer. In addition, you can receive the award shortly after receiving your PhD. Looking forward to hearing this year's recipients.